6h30 am, Picked up at Lao Cai Station upon your early arrival for over an hour drive uphill in a shared mini van to Sapa. After freshen up and Breakfast in a local restaurant you will have free time enjoy a free walk around this charming town, paying visit to Sapa market and the old cathedral where you can meet a lot of local ethnic minority peoples such as Black H’mong and Red Zao wearing their traditional colorful dresses selling their farming and gathering products and handicrafts for souvenir. 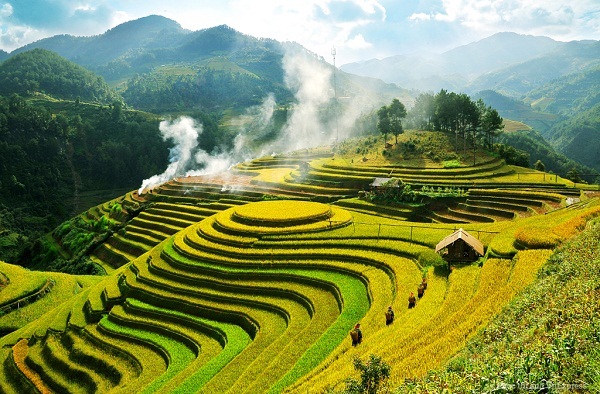 Check out to leave Sapa this morning, we will head to Mu Cang Chai where have beautiful terraced fields that was recognized as heritage of terraced fields. 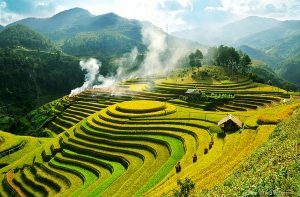 From Sapa town, our car will take us cross Tram Ton Pass where you can enjoy freshestand cool air and nice landscapes including Love Waterfall. Taking tours to visit villages ofMuong Khoa, Muong Kim and Na Kim where you can see very colorful minority groups. Lunch en route. Arrival in Mu Cang Chai at mid afternoon, we will drive to Kim Noi village, the village of Black Thai people, one family here will be our host today. Leisure time we may take a strolling around this village to see the normal life of villagers. Dinner with family. After having breakfast at the homestay, we will walk to visit Hua Khat Village which is home to Hmong Tribe and it will be great day for photo opportunity with amazing landscape of rice paddy. Continue to walk to the main road where car is waiting for, crossing Cao Pha Pass on the bumpy road and visiting bee-growing farm and someminority groups on the way until you get to Tu Le. Check in the hotel then you are free at your leisure. After having breakfast ,we continue our trip by car to Hanoi via Muong Lo (Nghia Lo). This is quite unspoiled tourist destination where you can enjoy the most beautiful landscapes. Visiting Dzao and Thai minorities on the way. Lunch en route in your own. Arriving in Hanoi around 03:00 P.M, ends the tour by dropping you off at your hotel.